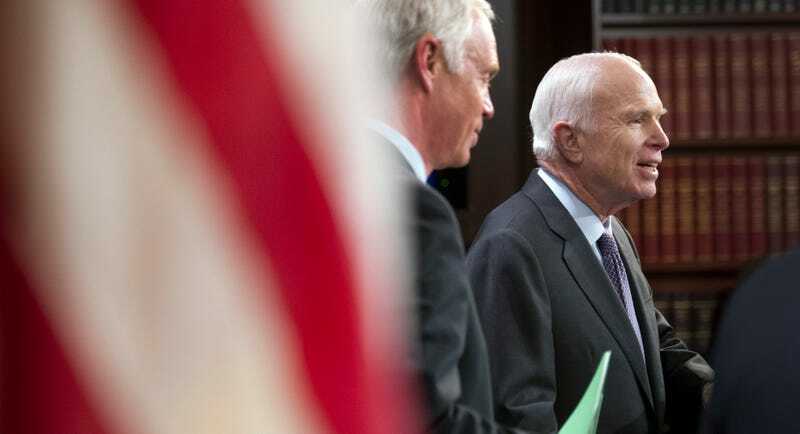 A couple weeks back, Senator John McCain treated the nation to a real showstopper of a C-SPAN feed as he toyed with millions of Americans’ health insurance access only to cast a deciding vote that upset the Republicans’ murderous agenda. Just a little over a week before the vote took place, the Arizona Senator announced that he had been diagnosed with brain cancer, and for a time it wasn’t clear whether he would return to the Senate to vote on the Republican’s so-called “skinny” repeal of the Affordable Care Act. When he did, Republicans—all of his colleagues, in fact—rejoiced. On Tuesday, Wisconsin Senator Ron Johnson presented a theory he has as to why McCain voted against his party’s bill: the brain tumor. Have we really reached the point where language is so carelessly, crassly deployed that “what was on his mind” is a euphemism for “brain tumor”? Seems like it.